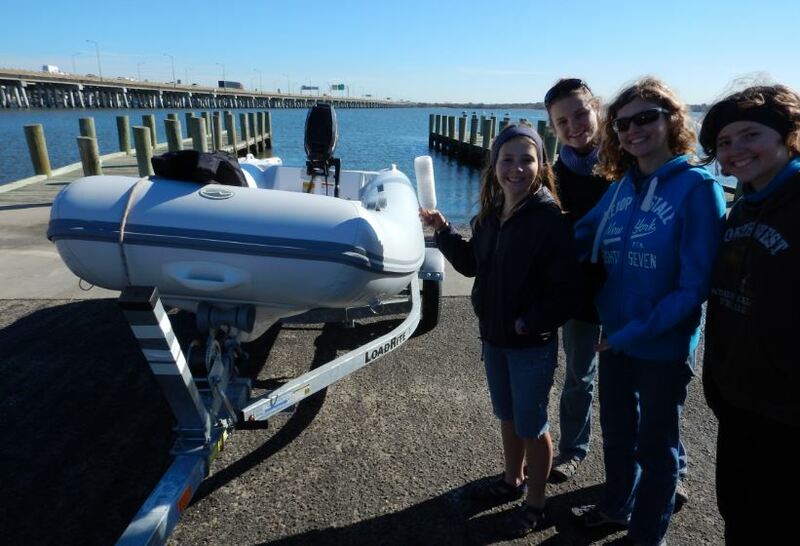 The second great dingy adventure – by Karin Jr. I was instructed to write about something heroic. I can make up a couple of wonderful stories, but the truth would be better. And to be completely truthful, I wasn’t really instructed to write about something heroic, but I’m going to anyhow. While we were still in New York, the great Dingy episode happened. Some of you may or may not know this story and I’m not going to tell it. But, the result was that JJ, our dingy, deflated rather easily. Someone had to sit in the bow of the dingy and keep pumping every time we used it. But now…. We were going to buy a NEW dingy! One that came from Norfolk Virginia! That’s why we went there in the first place. The people we bought it from, put it in the water for us and everything. My dad organized it all over email. So just before the lady launched the dingy (or rather, reversed the dingy trailer into the water) Sophia did the honours of hitting the new dingy with the pretend champagne bottle. The bottle might not have been glass, but there were bubbles inside it, so I think we did a realistic imitation. (The now famous bottle, was found in JJ. It was full of soap water, probably left in the dingy after Marike and my dad tried to find all the holes in it.) We christened our new dingy “Shampoo Andy Conditioner too.” And we call him Andy… Handy Andy. And needless to say we all love Andy. He has cup holders and everything. Now…. Ladies, Gentlemen and the odd fruit on the dinner table. As I said this was going to be a heroic blog, some of you might be sitting there, or standing there, or even be doing a random handstand there. Thinking: “But where was the heroics in all that?” I will therefore point them all out to you. My dad making the heroic decision to buy Andy. To save his poor crew from sinking into the dark and cold waters of the bay. Sophia, for doing the honourable and extremely dangerous act of christening Andy. The pretend champagne bottle, for happening to be in JJ. And not breaking, which would have put Sophia in even more danger. And last of all Andy. For having cup holders. Thus…. Ladies, Gentlemen and the odd fruit that might now be in your stomach, the heroics of this blog is overwhelming. And that is why, the blog is so short. If I included everything we did in Norfolk, there would be a lot more heroics, which would have broken your computer with the overwhelmingness of it all. So you see, even if it is a rather short blog, I’m doing you a favour by not breaking your computer/phone/anything which has access to this blog.